March 28, 2016 By Allyson 28 Comments This post may contain affiliate links. Read my disclosure policy. Creamy Pesto Caprese Potato Salad is a delicious spring and summer salad that is lightened up with Greek Yogurt! I wanted to make this salad as a tribute to spring and summer! With my garden rapidly growing, my herbs and tomatoes are sprouting like CRAZY! 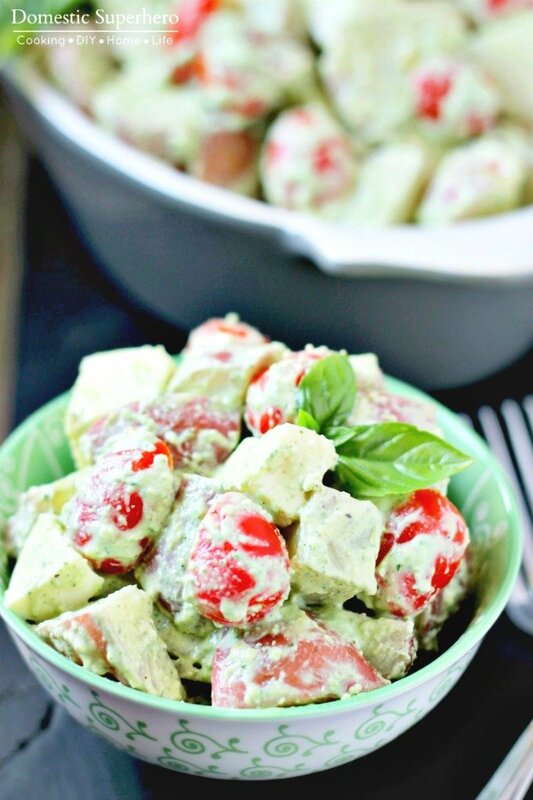 They are so tasty and had to include them in this fresh Creamy Pesto Caprese Potato Salad! It’s lightened up by using Greek yogurt in place of mayo, and you will love the fresh tang it brings to the Caprese Potato Salad! I wanted to use the fresh basil from my garden, which I was super excited about. I love growing different things and then using them in my meals! I harvested the basil and made a delicious creamy basil pesto! It’s simple and all you really need is a blender or food processor. I wanted it to be healthy though, not mayo based, so I decided to experiment with greek yogurt. It turned out delicious! I added grape tomatoes and chunks of fresh mozzarella to have a ‘caprese’ salad, and it would great! Using the greek yogurt in place of the mayo in the ‘creamy pesto’ really lightened things up, and made the flavor of the fresh basil pop. Hosting a Memorial Day BBQ?! Whip this up and serve in a gorgeous serving bowl for your guests! 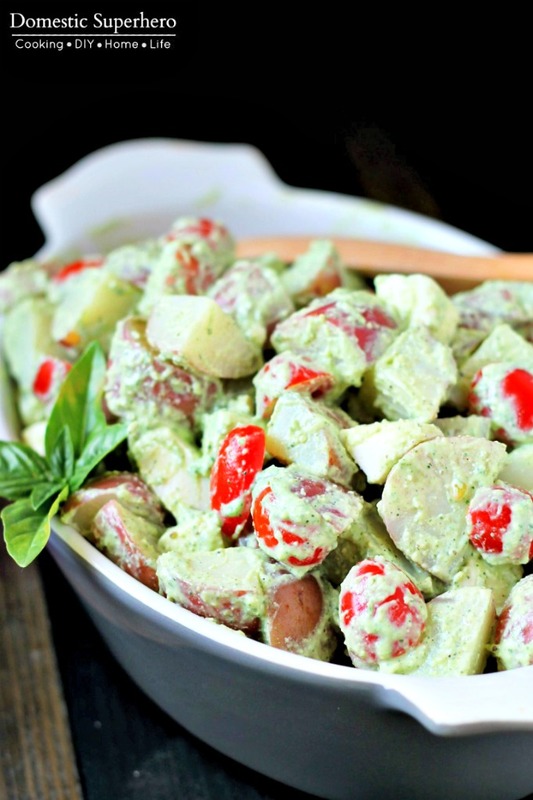 This Creamy Pesto Caprese Potato Salad is always a hit over the fourth of July! 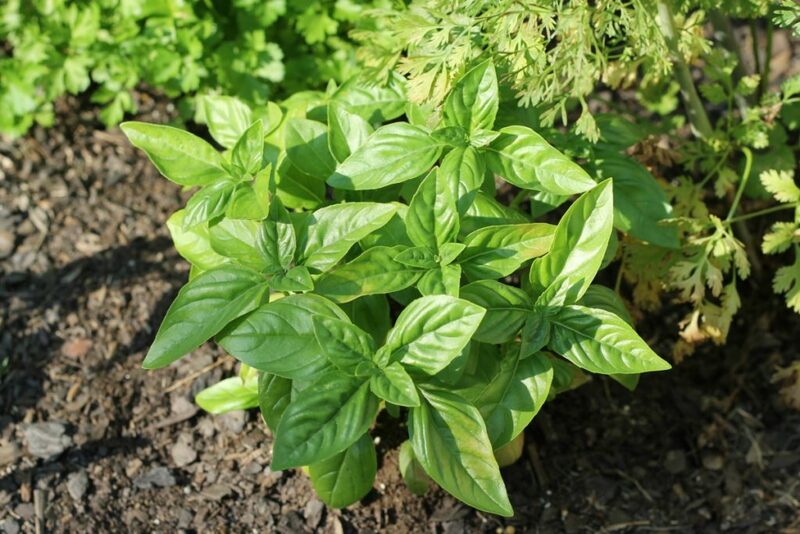 Your fresh basil should be plentiful by then as well as your tomatoes! 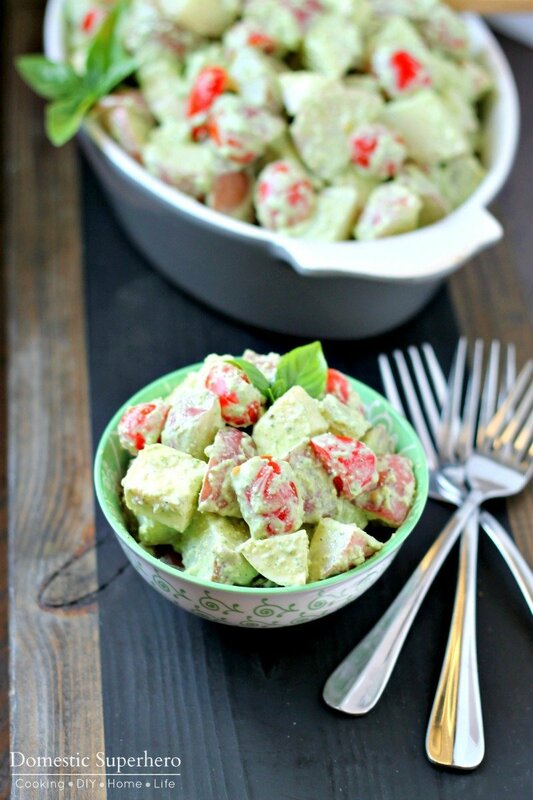 With Labor Day a hop skip away from the 4th, this salad can be made for any holiday occasion! 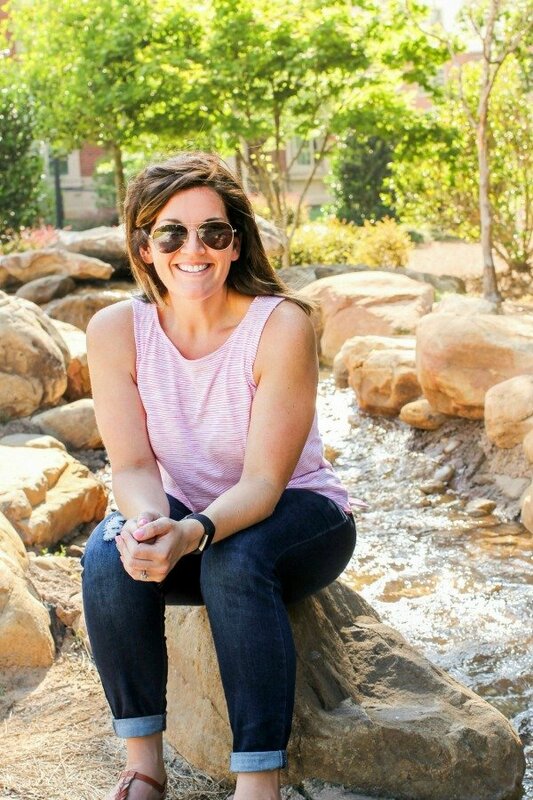 Hosting friends for a pool party?! 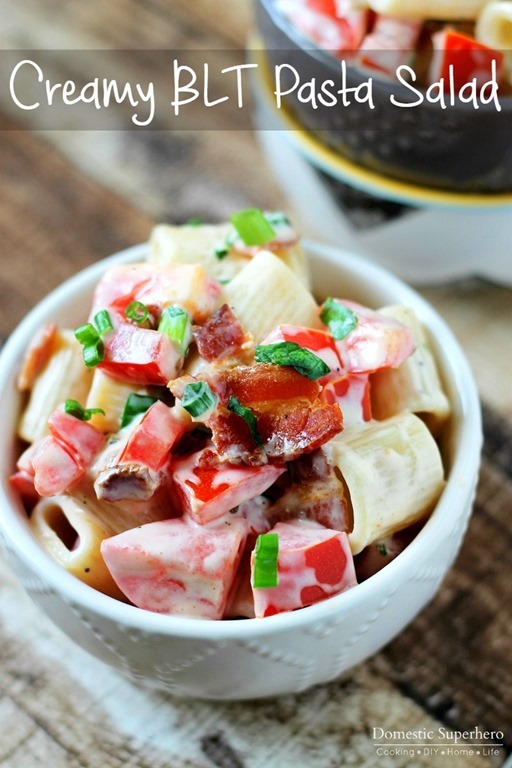 Cook this up the day before and allow flavors to meld in the fridge overnight – YUM! In a food processor combine basil, pine nuts, Parmesan cheese, black pepper, and salt. Pulse a few times to chop everything up. Once chopped, add lemon juice and start processing. Slowly add olive oil while mixing, and you will see the ingredients start to come together like a paste/pesto. I use about 1/4th cup but you might use more or less. Turn off and scrape down sides. Add Greek yogurt to food processor, and then process for about 30 seconds or until completely combined. In a large mixing or serving bowl, combine cooled potatoes, tomatoes, mozzarella, and then add the creamy pesto on top. Using a spatula, carefully fold the pesto into the potatoes, making sure to coat evenly. You don't want to mash the tomatoes or potatoes so do this carefully and slowly. Once evenly coated, cover and refrigerate for at least an hour. 1. Fill a large pot with water and bring to a boil. Add potatoes and cook for 8 minutes. Strain and run cold water over potatoes to stop cooking. While cooking, prepare the pesto: 2. In a food processor combine basil, pine nuts, Parmesan cheese, black pepper, and salt. Pulse a few times to chop everything up. Once chopped, add lemon juice and start processing. Slowly add olive oil while mixing, and you will see the ingredients start to come together like a paste/pesto. I use about 1/4th cup but you might use more or less. Turn off and scrape down sides. Add Greek yogurt to food processor, and then process for about 30 seconds or until completely combined. 3. In a large mixing or serving bowl, combine cooled potatoes, tomatoes, mozzarella, and then add the creamy pesto on top. Using a spatula, carefully fold the pesto into the potatoes, making sure to coat evenly. You don't want to mash the tomatoes or potatoes so do this carefully and slowly. 4. Once evenly coated, cover and refrigerate for at least an hour. Serve and enjoy! Like summer salads as much as I do?! Try these out! My basil plant is thriving right now so I will definitely be giving this a try. It looks delicious. That sounds delicious and absolutely perfect for summer cookouts! This sounds absolutely delicious! 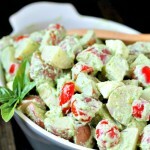 I love pesto and never thought to use it on potato salad, that’s genius! Your potato salad looks delicious! I love potato salad – I never thought to add pesto! Oh this sounds absolutely divine. I’ll just have to take out the nuts since I have nut allergy but other than that I so want to give this a try. Love pesto, I have never heard of adding greek yogurt to it, this sounds amazing! Not only does your recipe look fabulously delish, your garden is amazing!! And so are your photos! Great recipe (and blog)! Basil is also really good and healthy and a natural antibiotic. I know I used to eat it quite a bit when I had pain during my pregnancy. 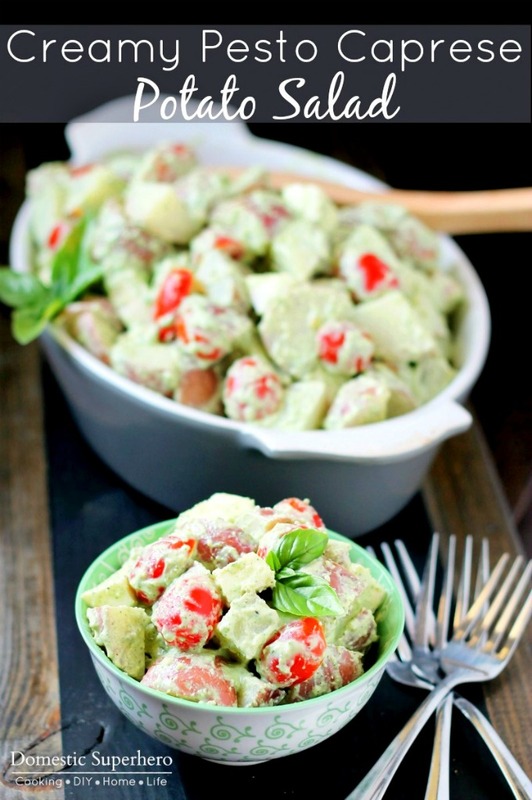 But this pesto potato salad looks great and I would love to try this! Looks Delicious I Can’t Wait To Make The Recipe!! This looks so mouthwatering! I would love to try this! Everything is growing beautifully and this looks like a great recipe. Thanks for sharing! What a great idea for summer! Will definitely try it, and I’m so impressed at your green thumb! Oh my goodness, this sounds awesome and looks great! I have all the veggies needed too in my garden! I usually don’t eat potato salad, but this would be an exception! It looks so tasty! That sounds really delicious. I loved when we planted potatoes in our garden! They did really awesome! I bet that’s delicious! I never would have considered making a potato salad like that. Your herb garden is beautiful. 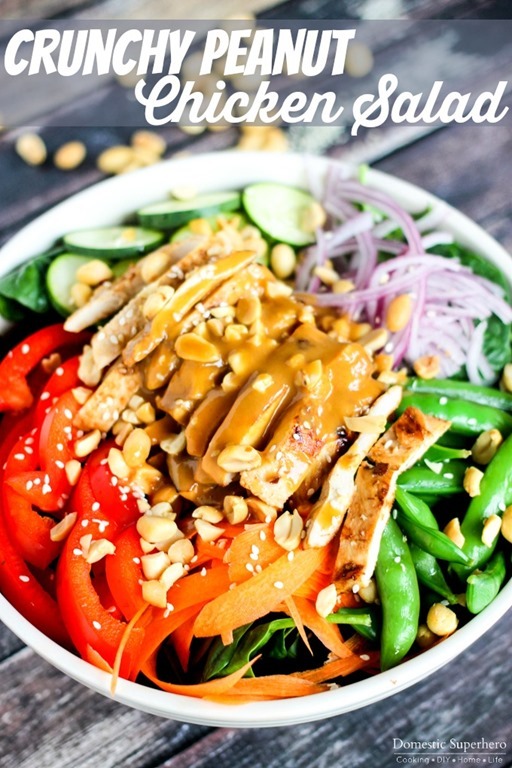 And this salad looks absolutely delicious! I’ve got some basil that’s about ready to be used too. Your salad sounds amazing! It is really wonderful that you can grow part of the ingredients for your food yourself. The salad sounds so wonderful and delicious. This looks great! I’m a huge fan of caprese salads & potatoes, so I can’t wait to try this. I also really like the salad bowl shown in the pictures. Where did you get it? The one in the front, the green one? It’s from TJ Maxx, but I bought them about 3 years ago – love them though! I always see cute bowls there 🙂 Thanks for stopping by! HI! Next time just scroll down to the recipe widget, and you can click print in the upper right hand corner. This makes it so just the recipe prints out for you!